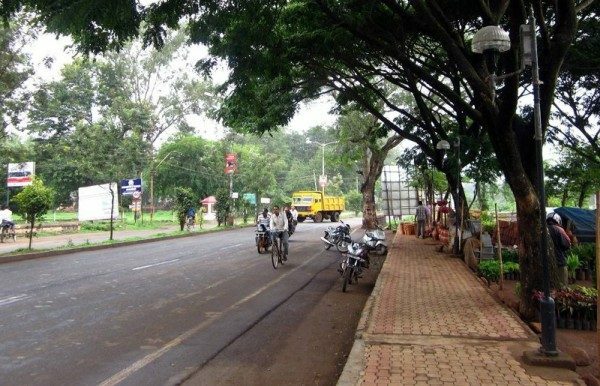 It would not be farcical to say that the state of the Congress road in Belagavi actually resembles the state of the Congress party in the country. In the monsoons it was far more worst, worst than loss in the recent assembly elections. Some Pavering patch work to a limited extent saved the face of the Congress road. Pavering left side footpath at Congress Main Road from Ramaswamy Road to 1st Railway gate, Belagavi at a cost of Rs.98,97,232.65 is also planned. The Other parts of Congress road are not in such Good state as well, the second gate to third gate section is the most affected with very little road being visible to the naked eye. The re carpeting of that stretch is of utmost urgency but at the same time the potholes fixed with Pavers must be re-carpeted again. The ride is very bouncy from Arun Theater upto Equitas Bank. It was earlier promised that the entire road needs to re laid, the not so bad College road is being re-carpeted but the very bad Congress road is not that too when Congress is ruling the state. With regards to the pavers on the left side Footpath, which was first conceived during the Vishwa Kannada Sammelana is useless and is only used by the Fruit sellers and almost 70% of it is intact except a few places (about 30-40 mtrs stretch in all) where it was washed away due to flash floods in recent July, and a sum of 98 lakhs for this Pavering? We still expect that the tenders for the other side of the roads will also be floated in the due course. Please also visit road from First gate to Guruprasad colony. The road has been badly dug by KEB while laying the cables. Recently I posted a complaint on Janahit and I received a reply that the issue is resolved. Yes it was resolved at 3 places where the road was dug across.. It is filled with gravel which has come out in just 15 days. The side of the road is not filled at all. You may visit the area and see for yourself. I don’t understand what is the meaning of resolving the complaint……Clearly an eyewash….Please address the problem at your earliest.If possible also inform us why 2 bridges have been constructed across the nala near MOON hospital..
Do come n see in KHASBAG teachers colony second cross to put pipe line for residents after teachers colony it was dug by J C B. the pies are led down but the digged road still not done tar . Imagine you staying there how would you fell. My humble request please visit once and do the needful.